Zup! Here's something to discuss about now.You know how it is these days, it's easy these days to keep abreast of what's happening.Why yes, of course, information overload is real. So, here is what is trending now Donna Cruz New Album. Hashtagging, mentioning, posting, this is what's new. And yup they are talking, totally cool, about this "MOR 101.9"
Check out Twitter (don't stop reading) for the feedback. Donna Cruz! Live na live sa MOR booth! 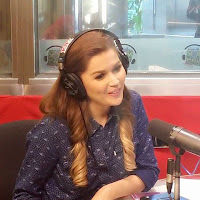 Kinig-nood sa www.mor1019.com!